Small but mighty, the Weber Smokey Joe 14” is the perfect grill on the go. Whether you’re tailgating at the ballpark or camping in the wilderness, the Weber Smokey Joe has all of your grilling needs covered. It’s a lightweight grill that’s perfect for traveling or cooking out for a small group. The Smokey Joe recently claimed the best portable grill honor on our guide to charcoal grills for 2018. Constructed in much the same way as the larger Weber kettles, you’ll find that the Smokey Joe does the same high quality job that we have all come to expect from Weber, one of the world’s most recognized and trusted brands. Should You Buy the Weber Smokey Joe 14”? The Smokey Joe has been popular for many years thanks to that Weber high quality, at a very small price tag. The Weber Smokey Joe 14” comes in two versions, Silver and Gold, and we’ll be discussing the differences between the two models. However, to begin, let’s talk about how they are similar. For starters, both models feature a 14.5 inch diameter cooking grate that is triple nickel plated. You might be wondering about why the diameter is 14.5 when the name says 14, but that’s just due to Weber renaming the grill to better fit with their marketing plans. 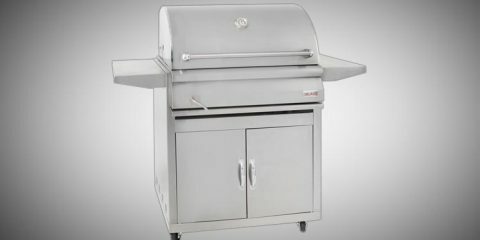 Weber assures customers that they still get that extra half inch of grill, it just isn’t in the product name. We checked to be sure, and the Weber Smokey Joe 14” is indeed 14.5 inches in diameter. To put that size into perspective, you’d reasonably be able to fit around three large steaks or six burgers at a time. So what’s the difference between silver and gold? We’ll go into more detail soon, but there is really only one key difference. The Weber Smokey Joe 14” Silver model has a small aluminum disc-shaped ash catcher located under the bottom damper. The Weber Smokey Joe 14” Gold model does not have an ash catcher, nor does it have a damper under the coal tray. However, the Gold model does come with a convenient handle that secures the lid during transport or storage. Durability – the Weber Smokey Joe 14” is built to last, and many customers share that they have had their Smokey Joe well over 10-15 years. 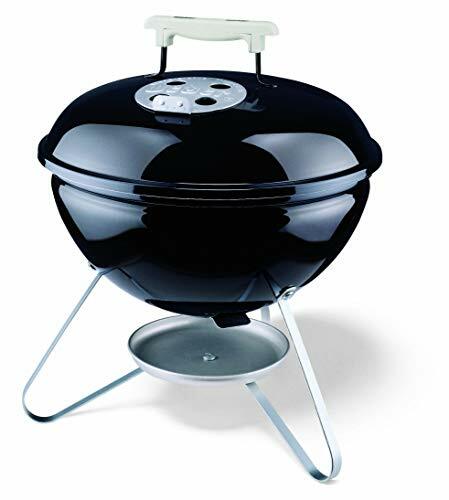 With a similar design and construction to the much larger Weber kettles, you get the high quality of other popular Weber models, but at a fraction of the price. Convenience – If you’re doing some small capacity outdoor cooking, the Weber Smokey Joe 14” is the way to go. It’s small, easy to transport, and can be used pretty much anywhere. Take it camping, to the beach, tailgating, or just simply use it in your backyard. Quick Assembly – There’s not much to this little grill, and its simplicity is a plus to its design. We had both the Silver and Gold models assembled in less than fifteen minutes, making for a fast and easy setup. Silver Model’s Ash Catcher – We prefer the Silver model’s ash catcher to the Gold model’s closed design. While it is nice that the closed base of the Gold model prevents hot ash from blowing around our food, it does make cleanup a bit more time consuming because ashes can’t be removed until the coals and the charcoal rack are removed. Gold Model’s “Tuck and Carry Lid Holder” – This locked lid makes transportation and storage of the Weber Smokey Joe more easy and convenient. The Gold model does cost a little more than the Silver, but this feature may make that worthwhile. 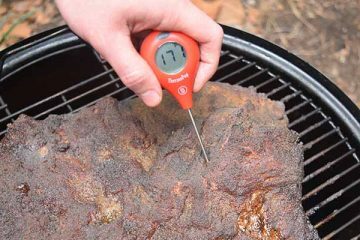 No Thermometer – While we don’t normally trust the thermometers frequently found in the lid of other Weber models due to their inaccuracy, the thermometer’s absence on the Smokey Joe is notable. 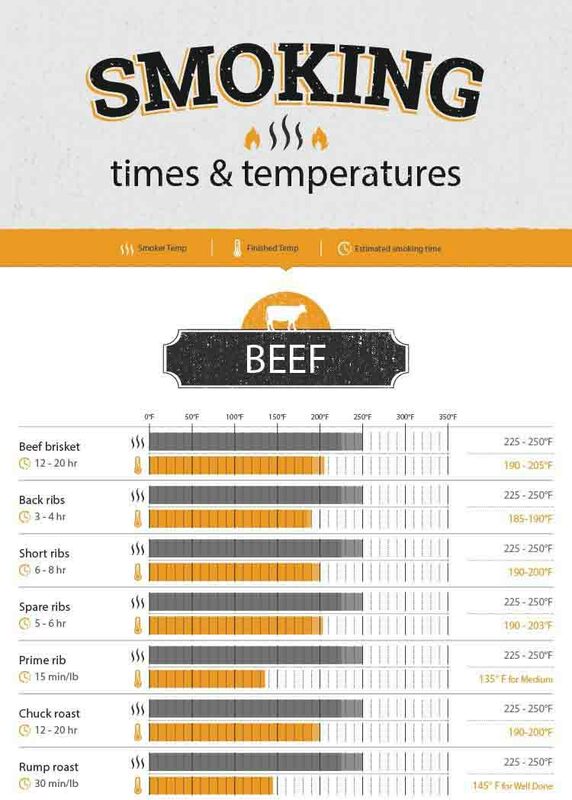 However, investing in a good digital thermometer makes for a good, quick fix to this problem. That being said, if you plan on cooking for larger groups of people you might want to think about upgrading to the Weber Kettle Original. So long as you plan on mainly cooking for 2-3 people at a time, or using other grills at the same time, then the Smoker Joe is a great portable grill. Get the latest price on Amazon. One thing can be said about Weber, they really don’t make a bad grill. The Weber Smokey Joe 14” is no exception. It still has the same high quality that we’ve come to expect from Weber. It’s built to last, and it comes with a ten year warranty. 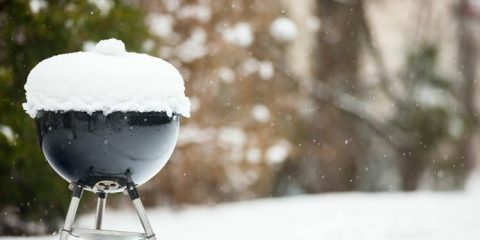 Many customers have had their Weber Smokey Joe for several years, and it has survived extensive travel and weathered all of the elements. They are solidly built and have several features, such as the porcelain enameled lid and bowl, that are designed with durability in mind. Both models feature a porcelain enameled bowl and lid, which is baked on at over 1500°F to fuse the finish to the steel, preventing rust and wear. The dampers on both the Silver and Gold versions are aluminum, resistant to rust, and allow for easy control of air and heat. 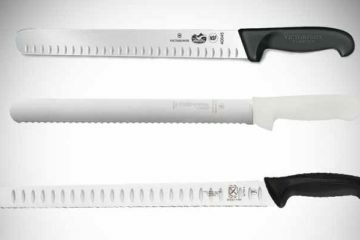 The nylon handle is glass reinforced for easy handling when removing or replacing the lid during cooking. The three legged design is also present on both models, and they weigh in at a very lightweight 9.5 pounds. Quick and easy to setup, you’ll find yourself spending mere minutes assembling the Weber Smokey Joe 14”, which means you can get to the real grilling sooner. The grill heats up fast and you can keep your coals hot by controlling the vents on the top (and on the bottom on the Silver model). Take the top completely off, and things get really hot really fast with the open air flow. 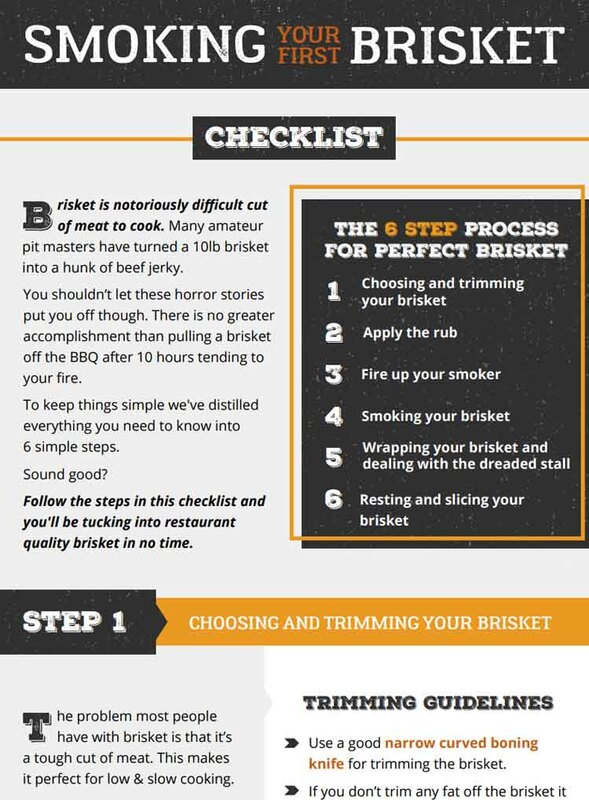 It’s the little things that count, and so it is worth mentioning that Weber includes a 31 page owners guide that’s packed full of cooking tips and recipes that will have you exploring a variety of different cooking options. With either model, cleanup can be a bit of a hassle, but we prefer the easier to clean ash catcher of the Silver model for a quicker cleanup. However, if we were doing more traveling, the Gold model has the Silver beat for ease of transportation thanks to its “Tuck and Carry Lid Holder”. With a little ingenuity you can even use the Smokey Joe as a smoker. Check out this video from Baby Back Maniac to see how it’s done. As we said before, the Gold model does not have an ash catcher, and its ashes cannot be removed until the coals and charcoal rack are removed first. This makes cleaning harder and more inconvenient, but may be a plus to some for the fact that you don’t have ashes blowing around during cooking, such as with the open plate ash catcher of the Silver model. 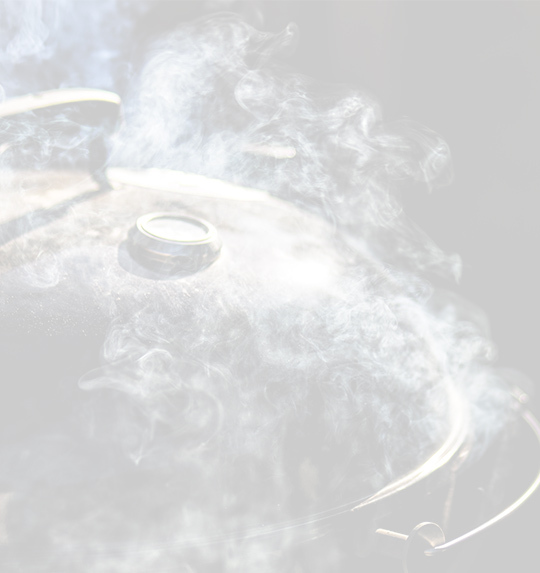 The ash catcher of the Silver model is convenient for easy cleaning, but one thing to be wary of is just how much the ashes fly around during your cooking, as they can not only get in your food but also clog up the vent holes of the bottom ventilation. The locking handle that secures the Gold model’s lid is a great feature that may be worth the few extra bucks for this model. It definitely comes in handy when you are on the go. So, which model is right for you? If you travel frequently and want a grill that’s made for being transported, go for the Gold. If you plan to use your Weber Smokey Joe more around the backyard rather than on the go, get the Silver model. 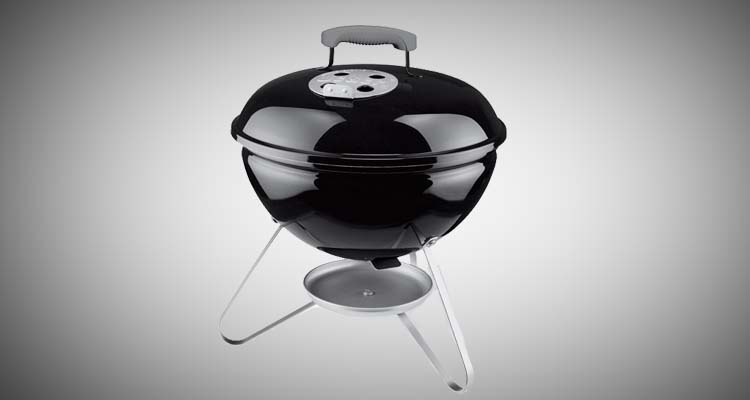 The Weber Smokey Joe 14” is a perfectly portable grill that’s great for small capacity cooking. If you’re a griller on the go looking for a grill that can meet your camping, tailgating, or picnic needs, look no further than the Weber Smokey Joe 14”. 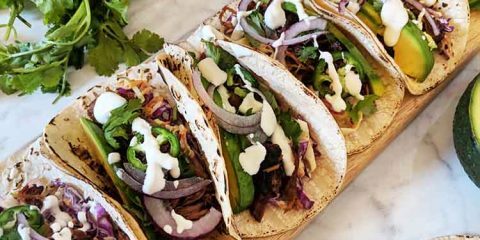 It delivers high quality cooking without a high price, and is built to last without needing any bells and whistles to make it a solid grill.